Going to preschool and kindergarten is an educationally empowering and transformative time in the development of your child. They are entering the world of schooling, something that will foster the ability to learn and grow as a student. 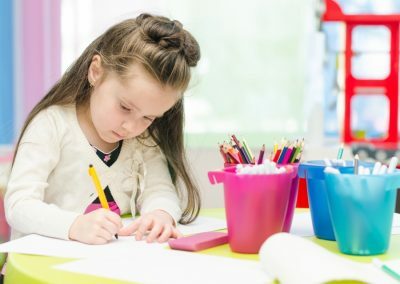 As important as it is to develop the fundamentals of math, writing and reading, fostering the inspiration for creativity and creative development is an integral part of the process at preschool. As a child continues to grow cognitively, creativity is immensely strong within children ages 3-6. This is a prime time to develop the structure for creative thoughts and thinking processes that can be utilized throughout their lives, both in and outside of school. Inspiring creative development can help with critical thinking, an essential and empowering skill for children to acquire. It also helps with problem solving, a stimulating and creative process that is crucial to early childhood development. Children are naturally curious, and Growing Kids likes to feed their creative side. At Growing Kids, we teach our preschoolers and kindergartens the fundamentals of math, writing and reading to help provide a strong foundation for their future educational endeavors. We also work to stimulate all areas of development, which includes creative interactions. This is showcased in our “Main Street” center at the heart of all of our educational centers. The Main Street allows for children to engage with each other to create social relationships, as well as foster creative thoughts. This offers children the opportunity to play, pretend, create, socialize and problem-solve. This sticks to our core values of allowing students to learn on through hands-on experiences, something that the “Main Street” can provide for your child. Growing Kids Learning Centers believes in inspiring creativity for preschoolers, and have modeled our programs to foster a creative atmosphere for our students. Contact us today to learn more!